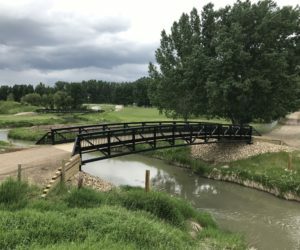 Nanton Golf Club Gets a new Bridge! Last week construction crews finished placing the new Nanton Golf Course bridge. This bridge was a black steel truss bridge with a timber deck. It was manufactured in the shop in Lethbridge and transported to the site in two pieces. The previous bridge was an old railway car that was dropped on makeshift abutments. It was damaged in the 2014 flood on the Mosquito Creek. The screw pile foundation presented a few challenges. Due to cobbles and boulders beneath the surface, they ended up about 100 mm too close together. This necessitated some design changes. The bridge was built in the plant in two sections. At the site, the two sections were lifted into place by a crane and fastened together. Then the crane moved the whole bridge into its final location. After that, the bridge was then field welded onto its screw pile foundations. Finally, the wingwalls and timber deck were installed. 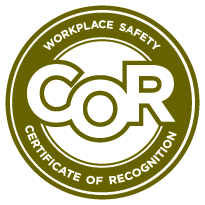 Roseke Engineering Ltd. was the design engineer for the project, and DeGraaf Excavating Ltd. was the contractor. Sundance Welding Ltd. constructed the bridge. All three parties were from Lethbridge. The owner was the Town of Nanton but the Nanton Golf Club is the primary user of the bridge since it is located at the edge of the golf course. The project was delivered as a design-build. The Nanton Golf Club is excited about having the services of a new bridge across the Mosquito Creek to serve golfers and maintenance vehicle traffic for many years to come.